Tabone Vineyards will be having its grand opening in late April! Are you excited to visit Detroit Vineyards? The Winery at Black Star Farms doubled up at the 2019 American Fine Wine Competition. Two of the five Best of Show winners from the competition were Black Star wines. The winery took top honors with its 2016 Semi-Dry Riesling from its vineyard in Leelanau County in the white wine competition. It also took the top spot in the sweet category with its 2016 Winter Harvest Riesling from Old Mission Peninsula grapes. Black Star Farms brought home some more bling! 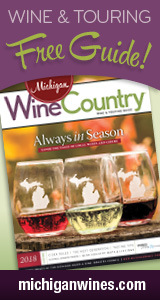 More coverage of the partnership that saved the Michigan Wine Competition and Gold Medal Reception.